Jeff Roquen is an independent scholar based in the United States. In stark contrast to the members of his own government, Churchill had long-characterized the Fuhrer as a dangerous tyrant and a threat to both the Continent and civilization. For his supreme insight and principled cry to thwart Hitler’s ambitions by force, Churchill, who became prime minister on 10 May 1940, enjoyed unprecedented popularity for his courage, resilience in the face of defeat and skills as a wartime leader and subsequently achieved iconic status thereafter. Although more than one thousand books have been written on his life, the recently-published Churchill: Walking with Destiny (2018) by Andrew Roberts merits consideration as the newly definitive one-volume biography of its subject due to presenting unequaled scholarly analyses of 1) the symbiotic relationship between Churchill, race and the British Empire and 2) a superlative, balanced evaluation of Churchill as statesman. From the outset, Roberts adroitly situates Churchill within the transcendent tide of race-based science and sociology in the mid and late nineteenth century. (deleted phrase) Scholars of the period debated the capacity for “lower” races to advance educationally, socially and technologically by Western standards. As a liberal imperialist and racial progressive relative to the regnant structure-of-thought, Churchill believed all races capable of “improvement” and worthy of respect and fundamental rights. In July 1900, delegates from around the world convened the first Pan-African Conference in London to boldly assert: “The problem of the twentieth-century is the problem of the colour line.” For Churchill and European-born individuals of nineteenth-century, however, the “colour line” existed as a concrete reality instead of a “problem.” While Voltaire (1694-1778) and Immanuel Kant (1724-1804) segmented humanity into separate and distinct races, Samuel Morton (1799-1851) and his disciple Josiah Nott (1804-1873), who earned medical degrees at the University of Edinburgh and the University of Pennsylvania respectively, altered nineteenth-century intellectual thought by successfully promoting and widely-disseminating the concept of an extant racial hierarchy in the state of nature from their scientific investigations. As notions of Anglo-Saxon superiority, African inferiority and other non-European races as middling or semi-developed became socially and intellectually normative, Churchill and his generation embraced the racial-ideological rationale behind the British Empire, which “covered more than one-fifth of the earth’s land surface” at the fin de siècle, to “uplift” the peoples of the world. In Chapter Two, Roberts perfectly captures Churchill’s formative worldview with a quote from his first public address on 26 July 1897: “then shall we continue to pursue that course marked out for us by an all-wise hand and carry out our mission of bearing peace, civilization and good government to the utter-most ends of the earth.” (46) Unlike many other Englishmen and Europeans, Churchill sought to extend the Empire as a vehicle of beneficent paternalism – a view that would later lose legitimacy due to an increasing rejection of race-based concepts in the scientific community and a wave of worldwide activism after the First World War. In April 1919, the decision of Brigadier General Reginald Dyer to unleash the firepower of his soldiers on an unarmed, peaceful assembly of men, women and children in Amritsar, India for refusing to disband also exposed the fissure between racial paternalists and non-paternalists in Britain. Despite cruelly ending the lives of approximately one thousand innocent civilians, Dyer received widespread support from those unsympathetic to “inferior races.” Speaking for the government and the majority, Churchill declared: “It is an extraordinary event, a monstrous event, an event which stands in singular and sinister isolation.” (272) After an official inquiry, Dyer was forced into an ignominious retirement. In delivering a remarkably clear, accurate and incisive portrait of Churchill as a product of an era marked by archaic science (racial hierarchy) and high ideals (human rights), Roberts illuminates the contours of the British imperial mind. Throughout the more than one-thousand-page tome, Roberts renders an extraordinarily judicious account of Churchill as both a prescient and at times – a wholly misguided statesman. One-quarter of a century before Chamberlain’s fateful trip to Munich (1938), Churchill began demonstrating his keen insight into the vicissitudes of Continental politics with particular respect to the rise of German militarism and questions related to the balance-of-power. Shortly after Berlin dispatched the gunboat Pantherto the port of Agadir (Morocco) to challenge French influence in 1911, the young British Home Secretary interpreted the provocative act as a portentous sign of aggression. To counter the looming threat, Churchill not only predicted Germany would “violate Belgian neutrality” in order to defeat France in a future war, but he also urged Whitehall to check German power by forging closer alliances with Paris and Moscow. (154-158) When German Admiral Alfred von Tirpitz rebuffed a third offer by London to negotiate a treaty limiting the production of battleships in early 1914, Churchill, who had been appointed as First Lord of the Admiralty, urged increases in naval armaments to prepare for war. In August, the Kaiser fulfilled his prophetic warnings by ordering German armies to invade and plunder Belgium en routeto Paris. (170-181) By 1924, Churchill began forecasting the possibility of a second world war as a result of the crippling sanctions imposed by the Treaty of Versailles (1920) and the concomitant rise of National Socialism (Nazism). If the author commendably succeeds in portraying Churchill as a sage prognosticator with respect to Wilhelmine and Nazi Germany, Roberts also masterfully details his failed political appraisals. In 1927, Churchill met Mussolini in Rome and publicly congratulated the Italian fascists for “[rendering] service to the whole world.” (325) Six years later, Churchill called Mussolini “The greatest lawgiver among men” and woefully depicted Japan as “an ancient state, with the highest state sense of national honour and patriotism” despite its atrocity-laden invasion and occupation of Manchuria. (366) From his faith in the paternalistic beneficence of the British Empire for “lesser races” (technological advances, parliamentary government, expansion of trade etc. ), Churchill colossally misjudged nationalist aspirations on the Indian subcontinent and – out of frustration – blasted the Home Rule for India campaign as “criminally mischievous” and labelled Mohandas Gandhi as “seditious” and a “danger [to]…white people.” (342-352) How did Churchill politically survive these egregious miscalculations and gaffes? In short, he possessed the capacity to admit error, alter his views to a degree, and temper his remarks. In measuring Churchill’s quasi-progressive record as a Minister of Parliament, support for Irish Home Rule, tenure as military strategist, unyielding stance against Nazism, sympathy for Zionism, obstinate resistance against independence for India, problematic relationship with Stalin and second term as Prime Minister (1951-55) between the bounds of his character and the generationally-accepted, tripartite prism of racial hierarchy, paternalism and belief in the world-historical mission of the British Empire – a mission replete with coercion and violence upon indigenous populations, Andrew Roberts has brilliantly reconstructed the life of a titanic figure of the twentieth century within the intellectual context of his times. 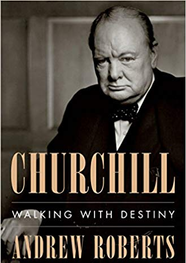 As such, Churchill: Walking with Destiny (2018) constitutes a first-rate, authentic work of historical scholarship for our time.